Left and right are artificial divisions in what is better modeled by a circular spectrum than a linear metaphor. The linear outlook has the TEA Party and OWS at opposite ends, the circular view has them shoulder to shoulder and over lapping on many issues. 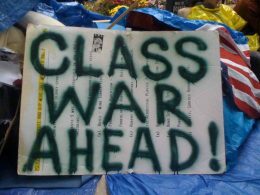 The OWS chant, "We are the 99%", is only true if the right-left dichotomy is given the boot. Dividing the 99% into opposing camps is the stratedgy long employed by the 1% to achieve their goal of keeping the hands of the many from around their necks. Sometimes though issues bubble up through the chowder that tear a hole in the veil of division. The most recent being the reaction of many from both the TEA Party and OWS camps to the NDAA. Both see the clear danger in abandoning long fought for rights in the name of bogus national security fears. Many from both nearby encampments have the same general reactions to The Patroit Act and the growing security state. Many everywhere in the spectrum agree that both major US parties and the system itself is so corrupted by big money as to be useless. Both working class groups hate the bank bailouts and the phoney stimulas packages that saved the dreams of the rich and foreclosed on everybody else's. Guess i'm a dreamer as well as an underdog rooter, but it looks like there is a chance that the common goals of all the 99% might come into focus soon. If there is to be a class war then the side of the many will need a ground game, an infantry of pacifist occupiers maybe. They'll need artillery too and the TEA Party's got plenty. Maybe a sagebrush nation stocked cavalry could ride in wearing white hats. 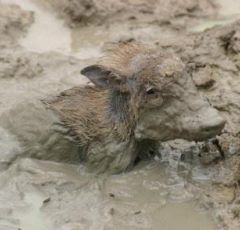 Let us not be divided, we, the 99%, are all in this together, ashes to ashes, mud to mud.